The purpose of Community Benefit Connect is to support nonprofit hospitals by building a learning community of practitioners who will translate into action community benefit planning, implementation, reporting and evaluation. 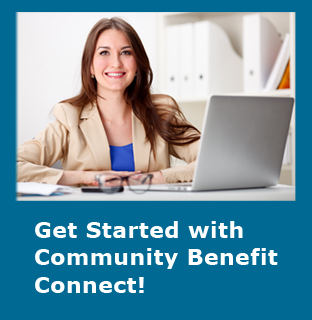 Provide easy to use community benefit tools to inspire action and effectiveness. Create a learning space for the community of practitioners. Facilitate the discovery of community benefit issues, ideas, opportunities and solutions. Support the transformation of community benefit activities toward a population-based health orientation. Nonprofit hospitals have a long history of providing health care for the poor in their community. For this service, they are granted tax exemptions and subsidies. Four main justifications underlie the benefits given to nonprofit hospitals. First, they provide care that is free or below cost to needy patients. Second, nonprofit hospitals provide community benefit in the form of education and services that may not be profitable. Third, they are the standard bearers for quality care. Finally, nonprofit hospitals contribute to the community as a valuable part of the infrastructure. However, the public is increasing its focus on accountability and transparency in nonprofit organizations. Public scrutiny of the charitable practices of tax-exempt hospitals is at an all-time high, driven by rising costs of care, questions about the actual cost of charitable care and the search by all levels of government for additional tax dollars to pay for health care. In addition, a lack of clarity about the charitable obligations of tax-exempt health care organizations and national media coverage on the billing and collection practices of hospitals have mobilized policymakers, regulators, health advocates and organized labor across the country to increasingly examine a broad spectrum of practices at nonprofit hospitals. As a result, the IRS is requiring documentation of community benefit activities through Schedule H of the Form 990 annual tax filings. Assuredly, the responsibilities around nonprofit hospitals’ community benefit activities and reporting will increase, and additional federal regulations are anticipated. Another significant health care trend that will amplify the role of community benefit is that of integrated health systems and the focus on community health. Since community benefit programs and activities are developed to improve community health, there is a link with new requirements for nonprofit hospitals to provide a continuum of care and focus on prevention of unnecessary hospitalizations. Community benefit efforts therefore can be aligned with the changes in hospital reimbursement and provision of financial incentives. Accentuate quality and stewardship, and produce measurable results for those community members who are most in need. Accurately meet the IRS requirements, and appropriately report activity. Emphasize evidence-based community health improvement for preventable illnesses to reduce the demand for high-cost medical services. Strategically use limited charitable resources. Increase the transparency of charitable activities. Foster a culture of social accountability that aligns with a nonprofit hospital’s mission, values and strategic plan. Support opportunities for nonprofit hospitals to align with Community Health Centers, United Ways, local health departments, community action agencies and financial institutions to reduce health disparities and improve health. Gray, B.H. & Schlesinger, M. (2009). Charitable expectations of Nonprofit Hospitals: Lessons From Maryland. Health Affairs, 28(5), w809-w821.